Adam Castiglioni shows us some of the mosaic that artist Ellen Harvey is installing at a South Station entrance at Summer Street and Atlantic Avenue. 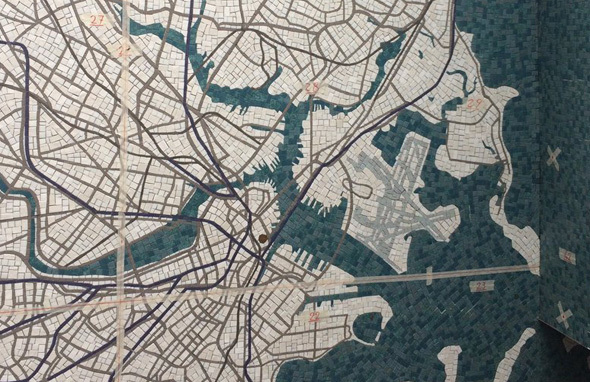 Harvey's map, titled "Network," uses hand-made glass tiles to show the web of transportation routes in the Boston area: Read more. How bad is the commute around here? It's so bad, the Mass Inc. Polling Group reports. that one out of five Massachusetts residents has considered moving somewhere else because of it. 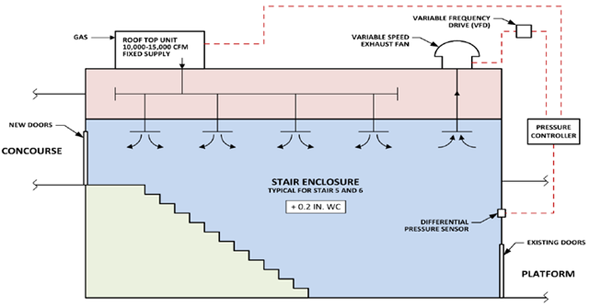 The MBTA reports it's begun work - finally - on systems aimed at curbing the amount of diesel smoke that now pours into Back Bay station's concourse whenever one of its trains pulls into the station. Read more. New shed being built next to Track 61. See it larger. 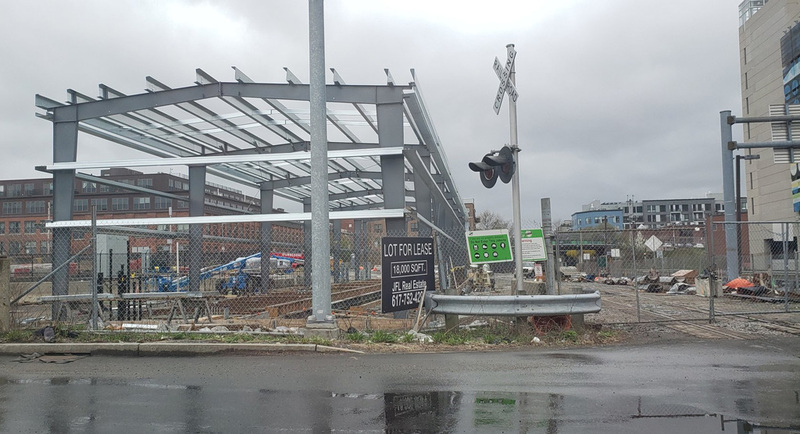 John Keith snapped a photo of a new shed and siding near Cypher Street that the MBTA is having built along Track 61 - a former freight line and the last rail connection to the South Boston Waterfront - where the T will test those new Red Line trains we should see someday. Read more. Dalgonon snapped the new upper busway at Forest Hills during the rain today shortly before 6 p.m. - probably making lower-busway riders jealous with how little water there was. In any case, the T promised to take a look. Firefighters getting ready to get on the tracks. Photo by Skyqrose. 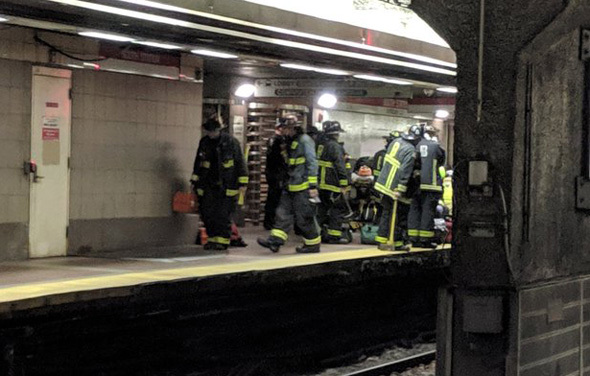 Skyqrose was among the Red Line passengers evacuated from South Station shortly after noon when an woman wound up under an outbound train coming into the station. Read more. At 8:39 a.m, Yael began reporting from a Red Line train beneath the streets of Cambridge: Read more. 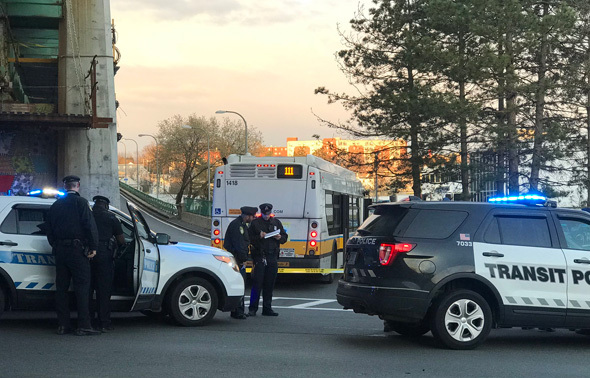 Transit Police report the woman killed at a ramp to the Tobin Bridge in Chelsea this morning was Mary Pettiglio, 60, of East Boston. They add the driver of the 111 bus, not named, was suspended as they and the Suffolk County District Attorney's office investigate the crash. The MBTA reports delays on the Red Line due to a train suffering from a mechanical problem at Broadway. Crash scene. Photo by Rick Macomber. NBC Boston reports on the death around 5:40 a.m. on Everett Avenue, involving a Route 111 bus and a 60-year-old local resident. Transit Police report arresting Richard Bridgeman, 53, on a charge of malicious destruction of property on account of how they say he hurled a brick at a T bus on Mass. Ave. near Shawumut Avenue around 10:30 a.m. yesterday, shattering the windshield. Read more. 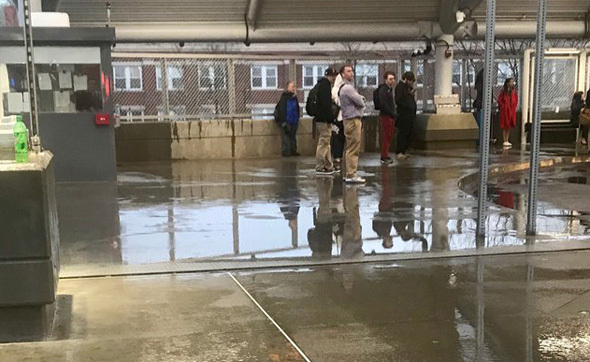 The MBTA reports service on the E Line is back to normal after a trolley died at the Longwood Medical Area stop and caused delays of up to 20 minutes. Another morning rush hour and the escalator at the TD Garden end of the underground walkway is out of service AGAIN. People backing up into the CR waiting area waiting to use the too narrow stairway. Who approved this mess of an inadequate design? The tunnel opened in January. 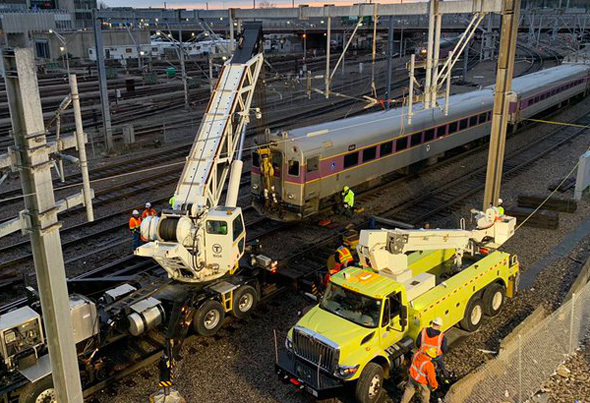 The MBTA is reporting delays on trains out of South Station due to another one of those upright derailments. NBC Boston has a photo of the cars in question - it might still be upright, but it's listing. NBC Boston also reports the cars derailed when two separate trains collided. The MBTA reports delays on the Blue Line because of a phone line that fell onto the overhead power wires. 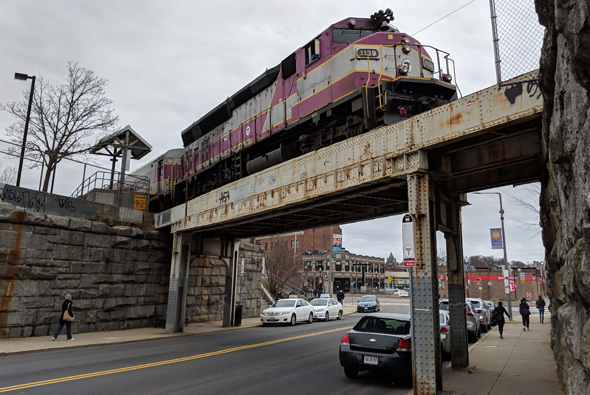 At first, the T said it was calling out some shuttle buses between Wonderland and Orient Heights, but says now the errant phone line has been disconnected and that actual train service is running again, if with the usual "residual" delays.